Donor Advised Funds (DAFs) are increasingly becoming a more prevalent giving tool in philanthropy. In fact, DAFs are the fastest-growing form of philanthropy today. In 2017, there were 463,622 individual DAFs across the country, together holding assets that surpassed the $100 billion mark for the first time, as reported in The National Philanthropic Trust’s 2018 DAF Report. This Report goes on to reveal that DAF donor contributions and grants reached record highs in 2017; donors contributed $29.23 billion to DAFs, using them to recommend $19.08 billion in grants to nonprofits. DAFs are attractive to donors because they are an easy, cost-efficient method individuals can use to donate to nonprofits, simplify record keeping around donations, and claim an immediate tax deductible charitable contribution. But how do nonprofit organizations approach DAFs? Most DAF fund managers do not offer an option for nonprofit organizations to apply for funds or introduce themselves, nor do they post an easily accessible listing of their managed DAF funds. Below, we explore the types of DAF funds available and provide suggested steps nonprofits can take to better their chances at receiving DAFs. What Are The Basic Principles Behind Donor-Advised Funds? Commercial funds: These are funds that were started by national financial-services firms, such as Fidelity Charitable, Goldman Sachs Charitable Gift Fund, Schwab Charitable, and Vanguard Charitable. Although they are separate nonprofit organizations from the financial-service firms, assets in the funds are often managed by the related investment company. Community Foundations:This is typically a nonprofit organization that supports a specific geographic area, offering grantmaking programs to address community needs and support local nonprofits. These Foundations will often offer to manage donor-advised funds and advise donors on local community needs or organizations that align with donor interests. Single-issue funds:These are sponsoring organizations that focus on a single issue and encourage giving to a particular cause or organization. This may include schools and faith-based organizations. Sometimes sponsors of these funds stipulate that donors must steer a certain percentage of their gifts to an institution, like a university. How Do DAFs Determine Who To Support? Guidestar:Users can search for nonprofits using a number of criteria, including: organization name, geographical area, cause area, revenue amount, and Guidestar profile level. Guidestar provides a platform for organizations to share a summary of their mission, programs, financials, and operations that can be viewed by potential donors. This appears to be the primary assessment tool that national sponsoring organizations recommend to their DAF fund donors. Charity Navigator:Users can search for nonprofits using a number of criteria, including: organization name, category/cause, location, and size (expenses). Charity Navigator currently only evaluates organizations with more than $1M in annual revenue, but does provide advice to users who want to evaluate a charity on their own; indicating that they should look at the financial health of the organization, accountability and transparency, and results. Descriptions of organizations are typically not as detailed as Guidestar summaries are, but users can donate directly to the nonprofit from the Charity Navigator website. Community Foundations managing DAFs typically provide more advice to donors than national sponsoring organizations. Many donors open accounts with their local community foundations because these funders tend to have a good understanding of the area’s nonprofits and many offer services such as family philanthropic consulting. Often, these Foundations will provide public listings and summaries of local organizations that may be of interest to donors. How do Nonprofit Organizations Tap into DAFs? Research the DAF sponsors in your geographic area and determine if they have any ways that the organization can approach donors (e.g., submittal of a summary of the organization that can appear in a listing of local nonprofits or if the Foundation releases any requests for proposals that are tied to DAFs). Ensure your organization is well represented on Guidestar (e.g., demonstrating high marks on the general targeted nonprofit assessment areas for donors such as financial health, transparency, program effectiveness) or any other applicable websites that offer donors nonprofit evaluation assessments. Let donors know on your website, and in all communications, that you can handle gifts from DAFs. Consider placing a prompt on your website allowing donors to give to your nonprofit directly from their DAFs. Provide avenues for DAF donors to find your organization. Publicize your work through media outlets to spark the interest of DAF donors. Make it easy for donors to learn about and discover your nonprofit. Santa Fe Community Foundation:This Foundation offers three kinds of donor advised funds: Gift funds, long-term invested funds, and permanent endowed funds. To assist donors in determining where to distribute their donor advised funds, The Foundation’s Giving Togetherprogram initiative summarizes all proposals it receives that meet basic due diligence, and includes them in a catalogue shared with donors each season. Donors are invited to make grants toward any proposal in the catalogue. Nonprofits that wish to be included in the Giving Together Catalogue can login into the online grant applicationand then click the option that allows applicants to complete a mini-proposal. This gives the Foundation just enough information to get the organization into the catalogue. Samples of past Giving Together catalogues are also available online. New Mexico Community Foundation: This Foundation offers a variety of funds to meet donor needs, including: donor advised funds, agency or nonprofit funds, geographic affiliate funds, fields of interest funds, etc. The Foundation helps donors identify where to distribute their contributions through grants, programs, and scholarships. One example, is a listing of program partnerson the Foundation’s website, where donors can learn more about local nonprofits and choose to support them through an online link. Nonprofits have the option of completing a Nonprofit Information Formso the Foundation can learn more of the work they do, and determine if they are a good fit with the Foundation’s program grants, donor interests, or other resources. The form can be updated annually. Albuquerque Community Foundation: This Foundation offers DAFs to individuals, families, and businesses. Types of funds include donor advised fund, family advised fund, fields of interest fund, now and forever fund, etc. There are no direct action steps needed to apply or be considered for ACF Donor Advised funds. The Foundation indicates that it is knowledgeable of most area nonprofits and can make donors aware of the greatest needs in the community, if they are unsure what they would like to support. Additionally, if there is a nonprofit that they are not familiar with, the Foundation will conduct research and provide the donor with the information. Community Foundation of Southern New Mexico: This Foundation manages and invests charitable funds for individuals, families, businesses and other nonprofit organizations. The Foundation has more than $15 million in assets under management and administers more than 200 philanthropic funds that make grants to charitable organizations and causes worldwide. The Foundation offers nonprofits the opportunity to apply for a few DAF funds through annual grant cycles. It also has an online list of nonprofit partners and their mission statements for potential donors to learn more about organizations they may wish to support. Jewish Community Foundation of NewMexico: The Foundation’s mission is to build and perpetuate support for a vibrant, caring Jewish community through partnerships with donors and organizations. Approach:The Foundation manages the following funds that accept applications from charitable organizations: Jewish Women’s Endowment Fund and Immigrant and Refugee Assistance Fund. Ensure they are in good standing with the IRS as a 501(c)(3) public charity. Earn a GuideStar Seal of Transparencyand provide robust information in their Guidestar profile, giving donors background information about the nonprofit, the work it does, and demonstrating transparency. Put a link to DAF Directon their website, or include a link with the organization’s “donate now” messaging next to Mastercard, VISA, and PayPal. Donors who already have a donor-advised fund are able to submit their grant recommendations from the organization’s website immediately. Note: DAF Direct is a tool that enables donors to recommend grants through their donor-advised fund directly from an organization’s website. There are no transaction fees, and the full grant value goes to the recipient organization. Increase visibility by keeping GuideStar profile up to date. Include a DAF direct link on their website, making it easier for people to make donations. Vanguard Charitable: Established in 1997, this organization has made $8 billion in grants to charity since its inception, including 740,000 grants. It currently has 17,500 active accounts. Nonprofit approach:Vanguard encourages donors to get to know the organizations they wish to donate to before granting, and indicates that donors will often use GuideStar as a resource. Fifteen years in a blink. 2018 marked TGP’s 15th year in business and got me reminiscing about our amazing journey. Sixteen years ago, I was new to Albuquerque and didn’t know where to start. I took a temp job at a well-respected local nonprofit where I was nurtured professionally and began to learn the community. When my assignment ended, both the nonprofit and I wanted to find a way to continue working together, and the way it made the most sense was for me to assist on a contract basis with resource development. I bought Grant Writing for Dummies and taught myself grant seeking. Erin, my sister who was in grad school at UNM at the time, kindly edited drafts and helped with language as I crafted my first grants. That was in 2002. In 2003, Erin and I recognized this could be something really good. We formed a partnership and officially began pursuing grant consulting. Our one client began referring other nonprofits to us, saying, “You should try these sisters.”We mailed out one piece of collateral to a list of about 40 nonprofits, and that’s where our story began. In 2007, we added our first business manager, a role now adeptly filled by Paula, who has been with us since 2010. In 2008, we knew we either needed to start saying no to additional work or hire more writers. We decided to take the leap from owning a job to owning a small business, and we hired Aly and Wendy. Here we are now in 2019, with a team of 12. Rounding out the TGP family are Jenny (2012), Cecily (2015), Melissa (2016), Robert (2016, for The Grants Collective), and in 2018 we hired Caitlin, Mary Kate, and Deanna. And we’re hiring again! Please pass along our job postings to your network. Planting Seeds that Grow… and counting. As of December, we had written proposals in 2018 that were awarded $25,195,648 (and 34 cents, we track every penny). This number represents notifications we had received as of the end of the year. It takes 4-6 months into the following year to close out all the grant requests. We look forward to reporting on this in mid-2019. Presbyterian Healthcare Services received a 5-year grant from the Centers for Disease Control and Prevention for Racial and Ethnic Approaches to Community Health. The project, Healthy Here, will reduce health disparities among Hispanic and Native American populations living in three high-poverty urban and peri-urban areas in Bernalillo County, New Mexico. NACA Inspired Schools Network (NISN) received a 3-year National Dissemination Grant from the U.S. Department of Education to expand educational opportunities for underserved students by developing and disseminating information and best practices in accessing, planning, and funding facilities for charter schools. The project focuses on schools serving Native American and other historically marginalized communities in rural, tribal, and other under-resourced areas. NISN also received a 4-year Native Community Youth Project grant from the U.S. Department of Education to establish schools in northwest New Mexico that provide culturally-relevant college-preparatory programs and rigorous academics in areas that serve significant Indian student populations. NISN establishes schools that reflect the needs of tribal communities. This grant will help NISN create educational choice by expanding the NISN network, support college and career readiness in network schools, create an Indigenous educator pipeline, develop a model for developing tribal grant schools, and work toward tribal school authorization. The 2ndJudicial District Attorney of Bernalillo County received several awards from the U.S. Department of Justice. These included a 3-year grant for the Albuquerque International District Community-Based Crime Reduction Plan. The project will include enforcement, focused on hot spot policing and violent crime reduction; smart prosecution, focused on data-driven case decisions; place-based crime prevention, based on community mobilization, group violence intervention, and environmental design; and community development and social service supports, focused on health, housing, substance abuse, and economic opportunity. Another grant was the Bureau of Justice Affairs National Sexual Assault Kit Initiative, for which the D.A.’s Office received a 3-year grant to scale its capacity to process SAEK backlogs. It will establish a formal Sexual Assault Cold Case unit in order to bring justice to the victims of sexual assault in our district and prosecute approximately 300 of the estimated 585 viable cases. Rounding out their awards, the D.A.’s Office was awarded a 2-year grant for Technology Innovation for Public Safety. This grant will support the development of the Criminal Data Hub, an automated consolidated query of multiple datasets generating a comprehensive criminal history for each offender. Nusenda Credit Union, a certified Community Development Financial Institution and Low Income Credit Union, received a 1-year grant from the U.S. Small Business Administration for the Program for Investment in Micro-Entrepreneurs. With an SBA PRIME grant, Nusenda will provide capacity support and technical assistance for seven partner Microenterprise Development Organizations for its Co-op Capital community lending program, resulting in an estimated $250,000 in accessible, affordable microloans for approximately 65 disadvantaged micro-entrepreneurs. The New Mexico Mortgage Finance Authority received a 3-year grant from the U.S. Department of Housing and Urban Development to rehabilitate the homes of low-income, disabled veterans. The project, Home4Vets, will rehabilitate and/or modify an estimated 90 primary residences for eligible veterans statewide, at no cost to them. These notifications all came within a week or two – you can imagine the celebrations and hurrahs around the office. We’re Published! In 2018, Erin and I became published authors. We submitted a manuscript to the 2018 Grant Professionals Association (GPA) Journal, an annual peer-reviewed publication. Our article is called Increasing Capacity for Grant Professionals to Impact Economic and Community Development. In it, we assert that grant professionals have an imperative to use their profession to maximize the impact grants can have in their locales. This imperative is particularly important in the ten “philanthropic divide” states (including New Mexico), which have the fewest private foundation assets, indicating a scarcity of resources. In these states, grants can be used as an economic development driver. Our article provides a case study of the establishment and first two years of The Grants Collective, our non-profit education arm dedicated to growing grant seeking capacity. By nurturing local talent and coordinating collaborative grant seeking to boost social and economic vitality, the Collective’s goal is to develop a pool of talented grant professionals who can secure funding from outside of the state. Our Capacity-Building Work. Speaking of the Collective, 2018 saw the completion of two Talent Academy fellowship cohorts bringing our total to 27 professionals trained in high-performance grant seeking. In two short years, our first two cohorts already represent 17 organizations whose fellows have collectively secured more than $6.85 million, of which some $5.4 million came from funding sources outside of the state; we will begin tracking our third cohort’s success in 2019. We have also surpassed 120 members in our Cooperative Network of Nonprofits (our version of a local chapter of the Grant Professionals Association), a network of active grant seekers, grant makers, and community partners. We hosted 15 Brown Bag Luncheons on grantwriting and related activities, including special guests from the New Mexico Association of Grantmakers, local funders such as the Nusenda Foundation and Albuquerque Community Foundation, subject matter experts from Project ECHO and Central NM Community College, and other capacity builders such as Pivot Evaluation and New Mexico Thrives. We also deepened our partnership with our fiscally-sponsored project, Grow New Mexico. An important part of our team this year has been collaborating with Terry Brunner on his important work to develop projects to be grant-ready and provide expertise on financing grant/loan/investment packages. Warm Fuzzies.We love feeling the love! Thank you to our many clients and partners who let us share in their heartfelt work, and still somehow find the time to acknowledge our contribution that goes into securing grants. We keep an online log of them so that we can celebrate each other (and keep us going on those few hard days). Here are some of our favorites from 2018. It is our privilege to work with our many community partners around Albuquerque, the state, and now in other parts of the country. We look forward to entering our 16th year of providing superior and affordable resource development services that assist not-for-profit organizations to better the quality of life for their communities. Accessing capital is fundamental for a thriving community; however, the lack of available information regarding trends in community development at the county level makes it difficult for communities to strengthen underfunded sectors. The Urban Institute, a nonprofit research organization, addresses the lack of information available about trends in community development by gathering and synthesizing vital information and statistics. It created the Community Development Financial Flows data tool (apps.urban.org/features/community-development-financing) to better understand the funding landscape. This tool assesses investment in counties with more than 50,000 residents from 10 federal programs and regulatory supports. The data shows that, while some counties are successful in accessing federal capital, many more struggle significantly. Each indicator is separated into an “Overall” category and an “Among Similar Counties” category. Large counties have populations of more than 300,000 people; midsize counties have populations between 100,000 and 299,999 people; and small counties have populations between 50,000 and 99,999 people. New Mexico County populations are listed in the table below, and maps indicating county rankings follow. Rankings are based on 982 total counties surveyed, 219 of which were large counties, 373 of which were midsize counties, and 390 of which were small counties. The above rankings indicate that New Mexico counties largely fall behind other counties around the country in accessing community development investment overall. With few exceptions, nearly every county in every category ranked in the bottom half of national standings. However, when compared with counties of comparable size, New Mexico counties fare much better across indicators, with all counties ranked between 1 and 400 and Santa Fe County performing particularly well across indicators (as well as Doña Ana, Sandoval, Bernalillo, and Lea across some indicators). Notably, Santa Fe County ranks 13th in the Combined Overall category, and 2nd in Combined Overall when compared among midsize counties; and 3rd in the Impact Finance Overall category and 2nd in Impact Finance when compared among midsize counties. Doña Ana County ranks 73rd in the Impact Finance Overall category and 26th in Impact Finance when compared among midsize counties. Lea County ranks 308th in the Housing Overall category, but 90th in Housing when compared among small counties. Sandoval and Bernalillo Counties rank 282nd and 200th in the Impact Finance Overall category, respectively, but 92nd and 62nd in Impact Finance among midsize and large counties, respectively. What do these rankings mean for New Mexico? According to the Urban Institute, community development and associated rankings are actionable. Local reflection and targeted strategies can improve access to funding flows, with the Urban Institute citing the Community Development Financial Flows data tool as a catalyst for “sparking local dialogue and informing strategy design.” In New Mexico, government, collective impact groups, nonprofits, and more are taking action to effectively increase community development investment across the state. This year, U.S. Representative Michelle Lujan Grisham (now Governor-elect) helped pass an amendment to increase funding for Community Development Financial Institutions (CDFIs) in New Mexico. “CDFIs drive economic development by providing financial products like loans, investments, and tax credits to underserved communities including poor, rural, and tribal areas.” According to Rep. Lujan Grisham, the amendment “will enable New Mexican entrepreneurs to obtain capital to start and grow small businesses, help pueblos to build affordable housing, and provide access to economic development opportunities for rural communities throughout New Mexico.” Public and private entities have come together through such projects as Innovate ABQand City Alive to support job creation, systems change, and fostering economic development and local talent. Several nonprofits, including our nonprofit education arm The Grants Collective, have begun emphasizing expanding fundraising capacity and forging connections and relationships to build up communities. In a state where nearly 96% of all businesses are small businesses, New Mexicans are committed to investing in themselves. By connecting with one another and finding homegrown solutions to New Mexico’s community development investment issues, New Mexico’s rankings will continue to grow. For more information on the Urban Institute’s data tool, community development investment, and questions to guide discussion and reflection, please visit the Urban Institute’s website at www.urban.org. The Urban Institute, “How Does Your County Fare in Accessing Federal Community Development Funding?” http://www.urban.org/urban-wire/how-does-your-county-fare-accessing-federal-community-development-funding, 23 August 2018. Michelle Lujan Grisham, https://lujangrisham.house.gov/media-center/press-releases/rep-lujan-grisham-s-amendment-increase-community-development-financial, 2018. U.S. Small Business Administration, “Small Business Profile – New Mexico,” https://www.sba.gov/sites/default/files/advocacy/New_Mexico.pdf, 2016. Deciding which grant opportunities to pursue is a challenge; organizations with limited budgets and staff frequently try to reduce risk by pursuing the same grants and the same funding levels annually, often looking to small local foundations for funding. This approach can be a great way to start—it can help to develop strong relationships with funders over time, support consistent funding projections, and minimize the investment of time and resources in grant writing. However, it can also be valuable to stretch outside of your grant seeking comfort zone. Is your organization is looking to grow capacity, or add or change programs? Then it may be time to dream bigger and look to larger funding opportunities, even if you’re not completely sure you will be competitive. Generally, the process of shooting for bigger grants requires some trial runs before you hit on success, but in the meantime it can be a great way to help your organization get organized. The thought of sinking precious resources into a new, more-daunting-than-normal proposal with an uncertain outcome can be scary, especially if you’re not sure if your organization can be competitive. First of all, be realistic and do not overshoot. It is important to employ a strategic growth plan when it comes to grant seeking—grants are almost always highly competitive and your organization inevitably has limited resources to respond to RFPs. You want to identify opportunities that are a small stretch for your organization, but still within reach. With every new award, you are diversifying and increasing your budget, growing your capacity, and demonstrating that you can be a good steward of grant funds. All this means that you can continually expand your reach and the award size requested. Even if you are not funded, the process of putting together a more ambitious proposal, including a budget and all the attachments, can pay dividends. A larger, more process-intensive proposal forces planning and organization work to happen quickly because you have a deadline and a list of requirements. Those general thoughts of “we should update our financials and our org chart” become “we need to do those things now.” If you have partners that have been noncommittal for some time, the process can be an excuse to formalize those relationships and get roles and obligations in writing. Especially if your organization works with partners and you’re having a hard time getting them to commit to anything specific, working together on a large proposal can be galvanizing. Even when the terms of the proposal seem a bitbeyond your organization’s means, the proposal preparation process can be a useful exercise to getting your ducks in a row and set you up for future proposals for which you know you will be competitive. Let’s look at the benefits of progressively stretching your proposal-preparation wings. Create useful visuals like a logic model, services flowchart, and other infographics. These are handy both in proposals and for general marketing when you need to explain your program and/or organization. Allows you to dream big—what would you do if you had more funding? Writing something longer and more ambitious gives you material to draw from for smaller proposals, making other grants less work down the road. A bonus of going through this process—the more you write grants, the more practice you get thinking on a funder’s terms. Every funder speaks its own language, and your success rate will improve if you practice changing your writing voice to mirror it (while not compromising or changing your programming in order to chase funding). Look at the available materials that are written by the funder, such as the website or the RFP, and use their jargon and phrasing, focus on their priorities, and look at what types of projects they have funded in the past and make sure your organization seems well positioned relative to these funded projects. And a final thought—you might be more competitive than you think! At The Grant Plant, we submit at least a few “longshot” proposals every year as part of our strategy to help our clients grow their capacity and community impact. Many of these have been awarded and launch productive new relationships with funders. Remember, you have a 0% chance of an award if you don’t apply; submitting something ensures that you’re at least in the running. You never truly know who is going to review your proposal; your organization and the work you do may just be kind project they are looking for! How Can Hollywood Help You Write a Winning Proposal? Nearly everyone has a favorite movie with lines and moments they can recall years later. What makes movies so memorable? The viewer understands the problems and obstacles the hero faces, his or her desires, how achieving that goal or goals will change the world– and it’s clear when the problem is resolved. Exposition: Why should the audience care about the story they’re about to watch? A good movie makes you care about the characters, understand their circumstances quickly, and root for them to overcome their problems. In a grant proposal, this is typically your needs statement and/or community description. You need to make the reviewer picture your target population and community, and the issues they are facing. Where movies have visuals, you have statistics. Movies pick only the most compelling and high-quality images to convey a message (and, importantly, they relate directly to the problem that will be solved). You should be picky too. Use just enough compelling and reliable data to prove there is a problem, but don’t overload your reviewer with pages of numbers. Point of Attack: This is the moment in the story when the problem has a chance to be solved – when the hero gets their super powers. It makes the audience think, “That’s exactly what this world needs! We’re ready to tackle this problem!” In grant proposals, this is the organization description and background. Your super powers are your staff, history, evidence-base, or other proof that you’re good at what you do. It’s important that you tie this section directly to the problem. If the hero is fighting a giant underwater monster, the solution won’t be a high school football coach who can inspire their team. If the problem you present is low graduation rates, the reviewer wants to know how well you will tackle that problem specifically. Focus this section on your organization’s super powers (capacity) to solve the problem presented in the exposition. Rising Action: This is the meat of the story – the journey that the hero goes on to solve the problem. You learn of the hero’s allies and the strategies they use when unexpected issues arise, and you can easily follow the actions they take to resolve the problem at hand. In your proposal, this will typically be split among several sections, including your program description, partners, lessons learned from past experiences, and systems used to deal with unanticipated issues. It is important that everything you put here relates back to your exposition and inciting incident. A football coach who creates a great team and seeks advice from their mentor may solve a problem, but that won’t defeat a giant underwater monster. Climax: The entire movie has been building to this moment. It is when the question, “Will this problem get solved?” is answered. It is clear that the giant underwater monster has been defeated. For your proposal, this is your outcomes section. These outcomes should directly tie back to the exposition/needs statement. If the hero has been fighting a giant underwater monster, the movie doesn’t switch at the end to show you a high school football team that overcame all odds to win the state championship. While that may sound silly, it’s a trap that many grant writers fall into. They set up a strong problem but, in the end, their outcomes don’t actually solve or even relate to that problem. For every issue you describe in your needs statement, there needs to be a measurable outcome you can deliver on. If you can’t deliver an outcome to solve the problem, don’t bring up that problem (no matter how compelling it may be). Denouement/Falling Action: This is the proof that the story you just watched actually made a difference. You are reminded of the journey the hero took, and you see what the world looks like as a better place. In grant proposals, this proof is your budget and required attachments. Your budget, letters of commitment, 501(c)3 determination letter, and whatever else the proposal asks for are all proof you can do what you promise. Imagine the hero defeats the underwater monster and then, instantly, the movie cuts to the credits without any further resolution. How unsatisfying would that be? Could you trust that the hero actually defeated the monster? Is the world going to be OK? This approach could make a great movie unwatchable. The same is true for your proposal. Don’t leave the reviewer questioning your ability to pull off your amazing work; instead, make sure they have the proof needed to eliminate any questions that the solution you laid out will actually happen. As always, it must relate to the rest of your proposal. Now that you know how Hollywood writes gripping stories, use the above six sections to outline a proposal. The next time you write a grant, pull it out and you’ll already have done most of the work for yourself! This approach will help ensure that your proposal is strong, connected, and grips the reviewer from beginning to end. Now’s the Time to Join the Cooperative Network of Nonprofits! The Grants Collective is celebrating one year of launching the Cooperative Network for New Mexico’s Nonprofits in January 2018. It has been a wonderful year of supporting, innovating, and connecting our state’s nonprofit organizations, educational institutions, public agencies, and funder networks. We invite you to join the Cooperative Network and contribute to the vibrancy of the state’s nonprofit community, especially as it comes to collaborating and successfully competing for large grants from out of state. To celebrate its one-year anniversary and the plans we have for 2018, we are offering an 18% discount on an annual membership – a $90 savings! The Cooperative Network is an online platform plus in-person events that better connect our nonprofit community. 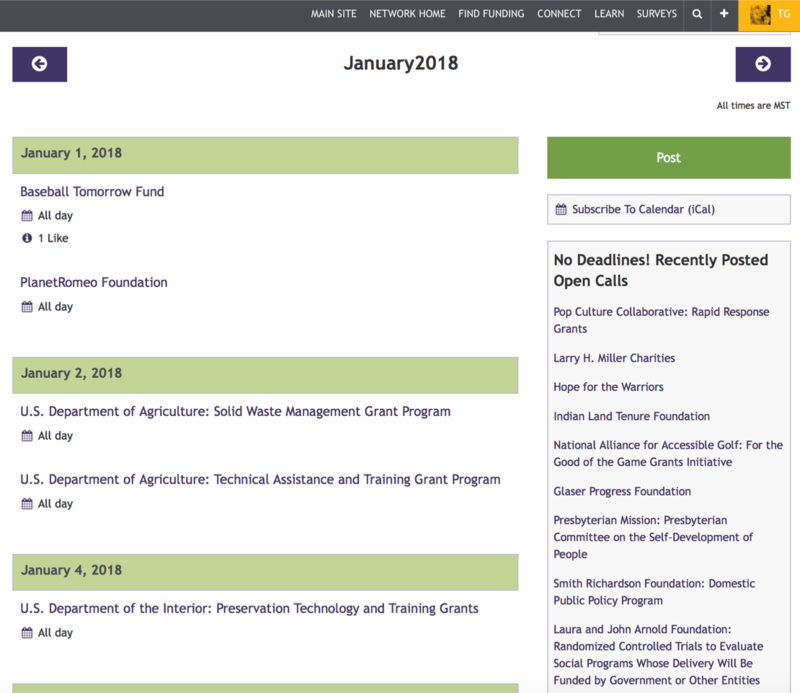 Find FundingThe Cooperative Network offers three grant calendars, all of which are curated for New Mexico to cut through the static and get you the most relevant opportunities: (1) Deadline-driven calendar, so you know what’s time-sensitive when it comes to your grant seeking, (2) Open opportunities, so you know what’s available to apply to year-round, and (3) Forecasted opportunities, so you can plan ahead. ConnectThe Cooperative Network is designed to make collaboration easier and more efficient. You have the opportunity to connect via: (1) In-person events that include Brownbag Lunches, Curbside Consulting, Coffee & Conversations, Thirsty Thursdays, and Reading Circles. (2) Forums that include open discussions, closed permission circles, and special interest groups. (3) Social network capabilities that allow members to post to each other’s walls, tag members in conversations, and share with each other. The Cooperative Network is a place for New Mexico nonprofits to up their games when it comes to grant seeking. 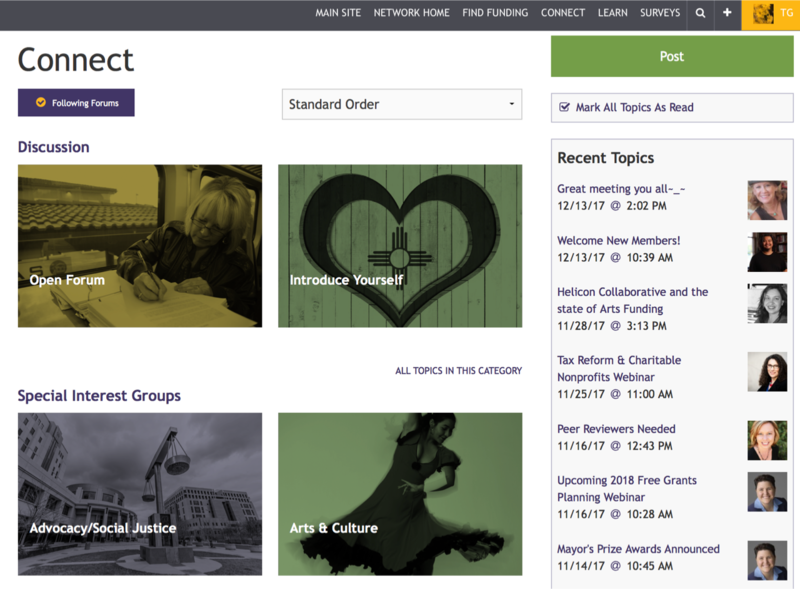 The Learn section provides: (1) Resources such as templates, tips, and articles, (2) The Grants Collective updates about our network, and (3) Other philanthropy and grant seeking blogs that are relevant, locally or nationally. These resources help subscribers pursue the best-aligned opportunities, improve capability and effectiveness in securing national dollars, and provide a formal avenue for collaboration and partnership in grant seeking. Your subscription gets you and a coworker access to the online members-only platform and in-person events. If grants are – or should be – part of your fundraising strategy and you are a New Mexico based tax-exempt agency, consider joining the Cooperative Network by pressing the button below. Our standard subscription rate is $50 per month or $500 per year. This month, save $90 – or 18% – to $410 for an annual subscription!